Justin Kovac is a self styled Eco Artist. Justin Kovac's works are developed from abstract compositions he often renders with the use of computer aided software which includes vectorizing drawings that will then be utilized in conjunction with a CNC machine. 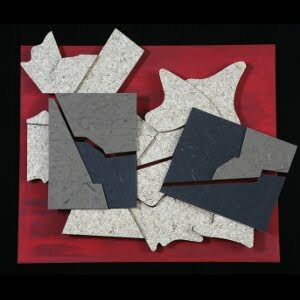 The results include stand out pieces such as Sunflower Red #1 2010 made with Sunflower hull fiberboard, chipboard, tree free handmade banana paper, Homasote, domestic poplar, Ultralight MDF type materials, non-toxic glue and non-toxic acrylic paint. A second Inventables customer is British born artist James Hopkins. 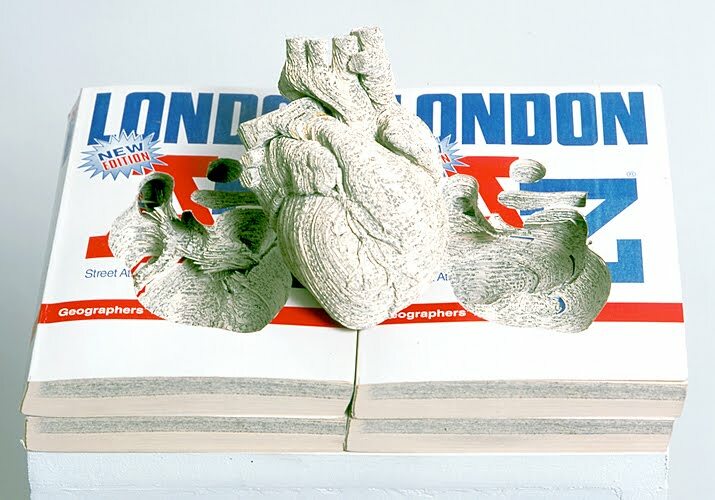 He has produced a series of thought-provoking, highly imaginative works, including Full Circle, 2000, a 3 dimensional paper sculpture of a human heart, carved from the pages of a London A-Z road maps book. 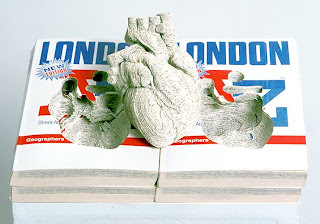 The appreciation for this artist's craft grows when you learn that each page is cut by hand with a scalpel from a print out stencil of a cross section of an object. The object is run through a split animation in accordance with the amount of pages needed to match the object's thickness. James recently bought a product from Inventables Hardware Store and is experimenting with it for an up coming piece. Stay tuned for a future blog post where we reveal his new work. In the meantime you can find out more at jameshopkinsworks.com.